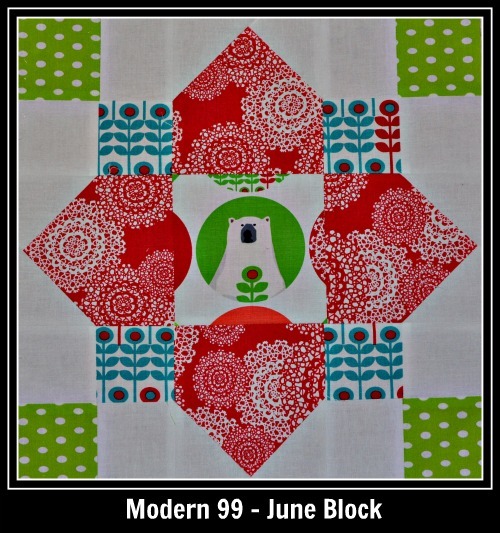 Modern Blocks: 99 Quilt Blocks from Your Favorite Designers. The fabric arrived on Monday and I stitched it right up and mailed it back on Wednesday. What I enjoyed most about this block was the red, almost diamond, shapes in the middle. Some of the other blocks we have made in this group are here, here, here, and here. I love your modern blocks! I will have to check our your others next week. I am a day away from finishing my big project. I love the little bear you centered in your block! Too cute!